Youth football brand Copa90 is set to work with Snapchat to deliver exclusive World Cup 2018 content in Russia this summer. From the 2 June, Copa90 will deliver 45 daily editions in English, French, Arabic, German and Spanish. The on-the-ground content will be delivered globally, except for the United States. Copa90 will make best use of Snapchat’s first-person storytelling capabilities to show the World Cup from the perspective of young, passionate fans putting those not in Russia right into the middle of the action. “Updated throughout the day, every day, this is a living, breathing, only-for-mobile adrenaline shot for the Snapchat generation that epitomises the style and approach of football content younger fans especially want to engage with, share and create,” James Kirkham, head of Copa90, said. 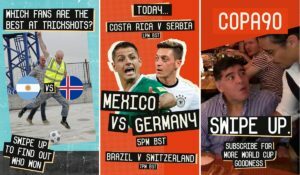 Snapchat is planning to entice brands onto its platform during the World Cup with its Snap Ads format, a fully vertical ad format that will appear on the Copa90 Stories during the competition. Snapchat boasts more than 187 million daily users globally.